Iran’s Judiciary chief has hailed the holding of the 6th International Conference on Palestinian Intifada in Tehran on February 21 and 22, saying it is an excellent opportunity to draw Muslims’ attention to the issue of Palestine. Iran’s Judiciary Chief Ayatollah Sadeq Amoli Larijani says the crimes committed by the Zionist regime of Israel against the innocent people of Palestine are, in fact, felonies against all Muslims. The 6th International Conference on Palestinian Intifada in Tehran on February 21 and 22 would be a favourable opportunity for the Islamic Republic of Iran, as the flag-bearer of the movement to support Palestine, to, once again, attract Muslims’ attention to this innocent nation, he went on to say. 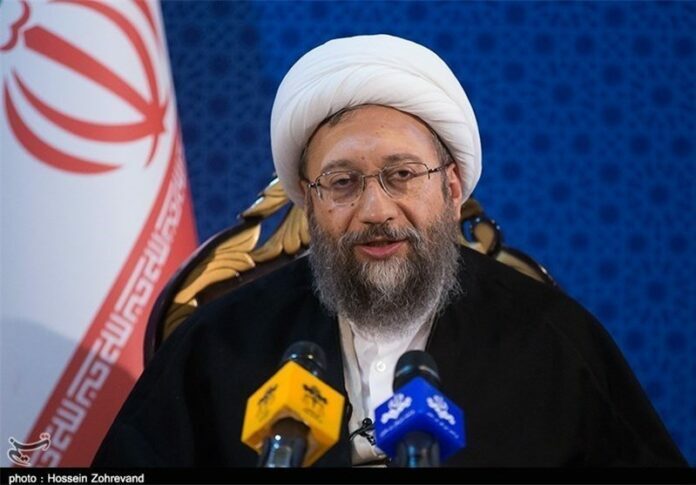 According to an IFP report, Ayatollah Amoli Larijani made the remarks in a meeting with top Iranian judiciary officials. On certain Arab states’ evident interactions and transactions with the Zionist regime, he said this conspicuous, yet concealed, closeness of a number of so-called Islamic governments with the Zionist regime is an ultimate treason. Commenting on the fresh round of sanctions imposed by the US on Iran, Ayatollah Amoli Larijani said the anti-Iran threats uttered by US statesmen corroborates the truthfulness of the remarks repeatedly made by the Leader of the Islamic Revolution Ayatollah Seyyed Ali Khamenei concerning the US unreliability. Although the US statesmen claim that their [recent] moves have not violated the nuclear deal between Iran and world powers, regrettably, the country has not been committed to the agreement, he added. “The US and its servile followers are all our enemies. They will not hesitate to deal blows to us in case they feel they have identified any weak point. We are required to give a resolute and clear-cut response to their threats,” the Judiciary chief added. On the floods hitting a number of Iranian provinces, particularly, in southern parts, Ayatollah Amoli Larijani said the people expect the government to immediately come to the aid of their compatriots in the disaster-stricken areas and, more importantly, take preventive measures through technical and expert meetings, to minimise the damages to be caused by future natural disasters. “Natural calamities take place all over the world. They are not controlled by human beings. However, we expect the respected government to use its facilities and resources and enhance its crisis management to be able to provide the victims of natural disasters with emergency assistance and take effective preventive measures prior to such sad events,” he added.